Bought one of these tuther day. When I press the GFCI Test Button it lights red as per the picture. Does that indicate good or bad? Instructions not clear. It probably just indicates that it was being used at that time. Did your RCD trip off when you pressed the button? Are there 3 lights at the top, as per the picture? Were they all off or red,red,off ? Nothing tripped. The red light came on. Your second post is exactly as per my instructions. All three top lights are off. It might sound a silly question, but was the socket you plugged your testing machine into working properly? I do not have any problems with my electrics but it does no harm to ensure nothing is wrong or fitted incorrectly. All my electrics work okay as far as I'm aware but I assumed that when pressing the GFCI test button, on the tester, the circuit breaker for that circuit would trip on the motherboard. It doesn't, so there's my worry. Being a sparky I could explain what the lights and words mean, but the above should tell you what you need to know ie. that it shouldn't be relied upon to verify safety around lethal energy ie. that it's a POS. A device to do what this claims to do could be made, but the manufacturers released a piece of crap previously, it costs bugger-all, the 'munual' is junk, and therefore the thing is suspect. Get a competent sparky to check your wiring (if you can find one .....). Last edited by docmartin; 11-03-2019 at 07:54 PM. What I was trying to do was test every socket in the house to ensure they were wired correctly. 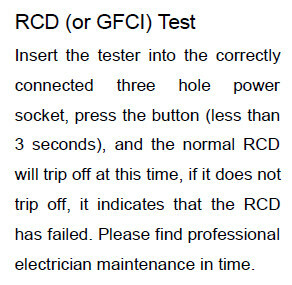 After each socket check I pressed the GFCI test button on the socket tester to see if it tripped the RCD on the board. It didn't. I just get a red light at 'GCFI button'. Does that mean somethings wrong or what? Sorry 'docmartin', call me thick, but I dunno what yer on about. Jeez how hard is it ? The 'tester' is junk, get a real sparky in. (changes to non-autistic mode) Now, now - you're not thick. Perhaps you don't have a comprehensive technical knowledge of electrickery. May I suggest that your purchase is possibly not the best thing since sliced bread and that for peace of mind it may be better to engage the services of a qualified technician. Last edited by docmartin; 11-03-2019 at 08:17 PM. Have you ever had a Thai electrician work for you? I did and I regretted it. No I haven’t had the pleasure. Can’t say I envy you - can’t get a decent test device, can’t get a real sparky. I’d help you if I wasn’t 6000 km away. Even if the tester was okay - what can you do if you do identify a fault ? Get a crap ‘sparky’ in ? What I was trying to do was test every socket in the house to ensure they were wired correctly. After each socket check I pressed the GFCI test button on the socket tester to see if it tripped the RCD on the board. It didn't. I just get a red light at 'GCFI button'. Does that mean somethings wrong or what? I don't know, but according to your manual maybe. The resaon I asked to see a photo of your breaker is to see if it is an RCD and not just an MCB. 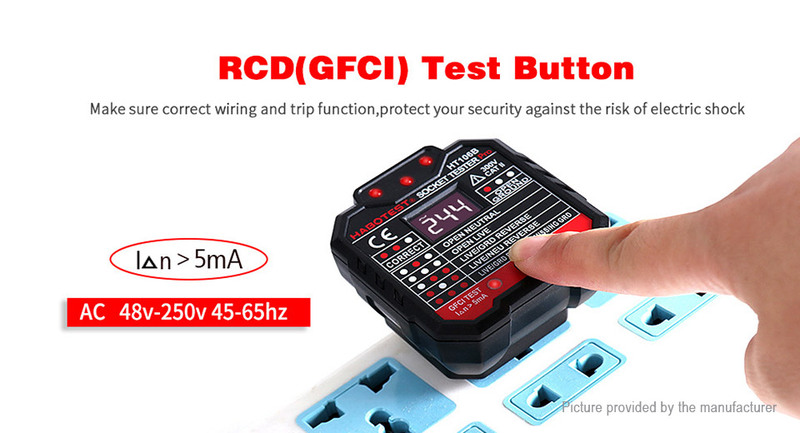 But if it is an RCD or RCCB, does it have a test button on it? If so, try pressing that to see what happens. Last edited by Neverna; 11-03-2019 at 08:44 PM. Looking at the picture, you should have had two reds and off for the top lights. That would be two 'hot' and earth. No lights suggest no power registered by the device. Device could be faulty if that is a known working socket. If the receptacle is wired correct, when you insert the “Socket Tester” in the receptacle you should see the voltage of the circuit indicated. The left and center two lamps should both be illuminated, the right lamp should be extinguished. When you press the test button the GFCI should trip. Electricity is dangerous – don’t trust your testing device unless you know for certain it works correctly. Looking at the picture, you should have had two reds and off for the top lights. Leftmost and middle LED on = Normal ie tester is correctly inserted. If the rightmost LED is also on then there is no ground connection without which you can't trigger an RCD to trip. I wonder if Prag's socket has an earth cable connected to it. As it is Thailand, it likely only has two holes and not three. wonder if Prag's socket has an earth cable connected to it. As it is Thailand, it likely only has two holes and not three. Well, you can not introduce a leakage from live to ground if there is no ground cable in the socket. You can also not do that if the tester is plugged in the wrong way so live and neutral are swapped since the tester then would try to create a leakage between neutral and ground instead of between live and ground. These two things must be right before pushing the GFCI test button. ^ A neutral to ground leak could still trip an RCD and can be a real bugger to find...as I have found out twice in my Thai house. However, in this case you are right as I doubt the tester would drop enough current in a neutral earth leak test. To paraphrase - ‘do this, get that or this, but don’t’. Thanks to all posters. I've now tested all my sockets. I found 2 with 'Open Ground' and 1 with 'Live/Neu Reverse'. My 'RCBO' trips when tested on the consumer unit so all's good. our house is a 5bed.size.and yes we found out after problems for the first 5yrs the co.that built the house their .electricans excuse I had to have a third party to do the work,lucky we were home when we smelt a burning at the el.box that has 14terminals.one completely melted.so we knew a sparky who lived by us and he got intouch with a P.E.A.worker,what he found was criminal.we then managed to get the sparky by us and do a complete overall of the whole house,he is very very professional,but is alaways very busy.just to give you an idea of what was found,live wirers hanging loosely above the ceiling. so PRAG. try and get one of them guys in yellow overalls. That is what I did in the past when I had problems with our showers giving electric shocks.